Been fishing lately? If you have, I bet you’ve noticed that there are a lot of suspended fish this time of year. 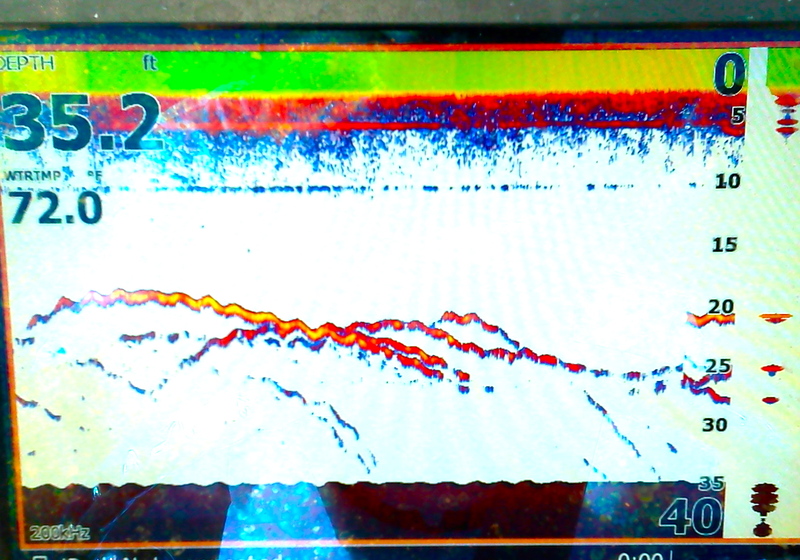 There’s nothing more frustrating to Chesapeake Bay light tackle fishermen than to see nice marks on the fish finder, then not get bites. 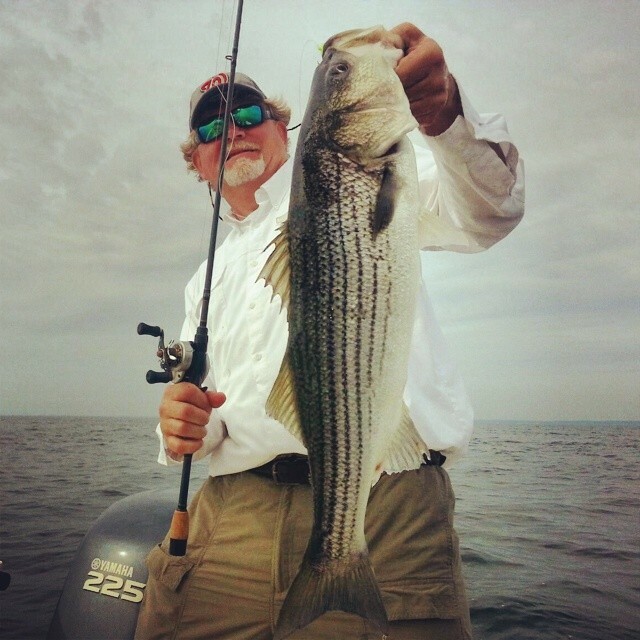 How do you catch those finicky suspended rockfish? Frankly, it’s tough, but there are some things you can do to increase your chances. To start, consider what’s going on below the surface. 1. Scope Out The Situation – Stripers adjust their feeding habits depending on conditions. Since the Chesapeake Bay is an estuary, conditions can change frequently. Sometimes changes are short-term like those brought on by tides and currents. Sometimes, they last longer like with seasonal water-temperature adjustments. There are even cases where conditions can change for years at a time. In the near-decade that I’ve been fishing the Chesapeake, I’ve noticed a change, particularly in the warmer months, to more fish feeding in temperate mid-level zones in open water. This can happen when the water conditions on the surface are not as comfortable as they are farther down. In the spring when we get a lot of rain, storm water runs off polluted roads, parking lots, fertilized lawns, and farmer’s fields resulting in a surface layer of unsalted, polluted water. Stripers will come up to feed in this layer when conditions are good and when they’re very hungry, but they’ll drop back down into the comfort zone when they aren’t extremely active. They usually won’t swim down deeper than forty feet or so because the water down deep may not hold enough oxygen, or the temperature or salinity can be uncomfortable for them. When they’re hungry, suspended fish aren’t that hard to catch, but when they aren’t actively feeding, it can be extremely frustrating because you can see them clearly on your fish finder, but they don’t want to bite. How do you catch them? 2. Rely on Reaction – As with any kind of fishing, there are no hard and fast rules, but the key to being successful on suspended fish is to keep trying different things until you find something to trigger reaction strikes. Every little thing matters and it’s important to use all the strike triggers in your light tackle arsenal. I pay particular attention to smell and taste triggers when I’m casting for suspended fish. Adding scent to your lures can attract fish that might not otherwise be inclined to bite. Scents can also mask smells they don’t like. Sight triggers are also important and I prefer lures with a lot of color contrast. Keep trying everything you know until you find something that works. Persistence is key. 3. Stay In The Strike Zone – It’s also critical to keep your lure in the strike zone when you’re chasing suspended fish. If you’re jigging above or below the fish, your chances are poor, so the longer you keep your lure in the temperate layer where they’re holding the better. There are some tricks to keeping your lure where the fish are. One is to jig vertically close to the boat using metal spoons. With this method you can make a reasonable estimate of how deep you are jigging compared to where you see the fish on your sonar. The only problem is, when the current is strong, your lure will keep riding up behind the boat. To adjust, you have to cast slightly forward in the current and jig along beside the boat as the lure falls back, then reel in once it gets too far behind you. This can be an effective method, but I don’t usually do it because I don’t like my chances for getting bigger fish when I’m jigging that close to the boat. I’d much rather cast farther away with soft plastics. 4. Fractions Matter – At least to me they do. My preferred technique is to use a scented bait like a BKD dipped or spray with fish attractant, or maybe a Gulp jerk shad or some other scented lure attached to a lighter jig head. Even an eighth of an ounce can make a difference. I’ve seen times when a five-eights-ounce head will catch fish on every cast while fish completely ignore a half-ounce jig. I like to cast my lure at a forty-five degree angle to the current and back away from the direction in which the boat is drifting. Then, I let it drop to the preferred depth and let it swing around behind the boat. As the boat keeps moving and the lure rides up, I let out more line so it stays in the temperate layer where the fish are. 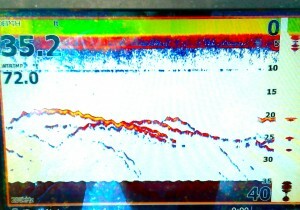 It helps to use a baitcaster because all I have to do is press a button to let out more line. I keep jigging and letting out line until the lure gets too far away from the boat to feel strikes, then I reel in and repeat. After some practice, you can get pretty good at keeping the lure at the depth where you want it. When I’m jigging, I use short erratic jerks and change it up from time to time. When I get a strike, I jig faster while trying to maintain that exact same depth. Frankly, there are times when you just can’t figure out suspended fish, but if you keep trying, chances are you will eventually trigger a reaction strike. If you don’t, keep moving around until you find conditions that are more favorable. The good news is that you can occasionally pick up some very nice fish out of suspended schools. I’ve fished several times over the past couple of weeks, mostly out of ramps on the Eastern Shore side of the Mid-Bay. Fishing has been good. There are still some post-spawn migratory fish around. They’re schooling up and feeding on the surface when conditions are favorable, then suspending the rest of the time. I’ve seen some very big schools of breakers including one that was nearly a half-mile long. The breaking fish are feeding on mostly rain minnows over oyster bars. 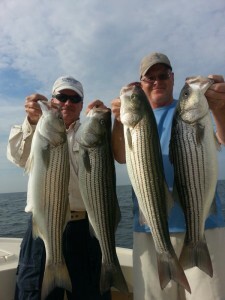 There are usually small fish on the surface and bigger stripers underneath. I haven’t heard of any really big fish being caught, but I’ve seen plenty in the thirty to thirty-five-inch range. 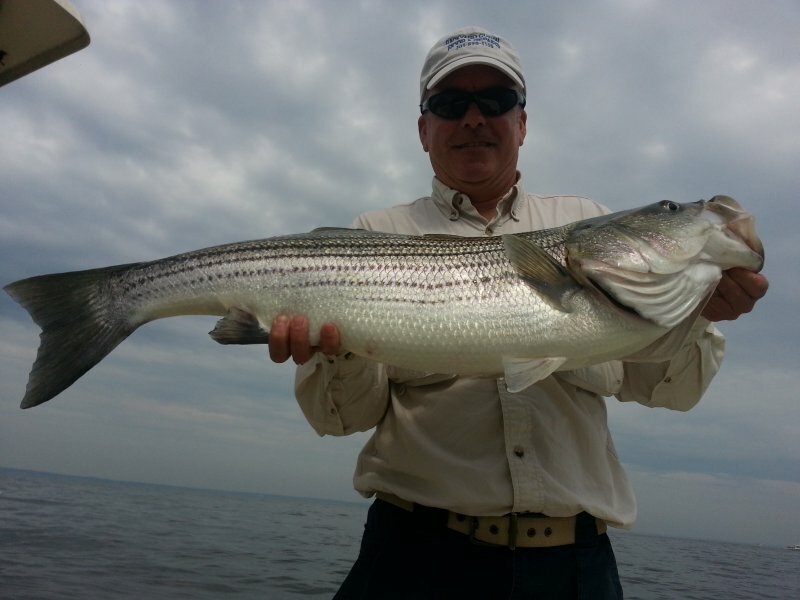 This is a fun time of year to cast with light tackle for Chesapeake Bay stripers. If you’re going next weekend, don’t forget to sign up for the Kent Narrows Light Tackle Catch & Release tournament. It’s Saturday, June 7th. This year there are lots of ways to win including a boat competition, a big fish Calcutta, and some special event categories. You can find additional details here on the CCA Maryland website. Here’s a ten-minute video of some exciting light-tackle action I enjoyed with my buddy Jamie Clough and Uncle Phill Anderson earlier this week. It includes some tips for modifying lures to catch those bigger stripers, and you can see the techniques we use while jigging. As you can tell by the fish we caught, they work! Good luck fishing and I hope to see you at the Kent Narrows Catch & Release tournament! - Don’t Keep ’em In Suspense! Thanks for the article. 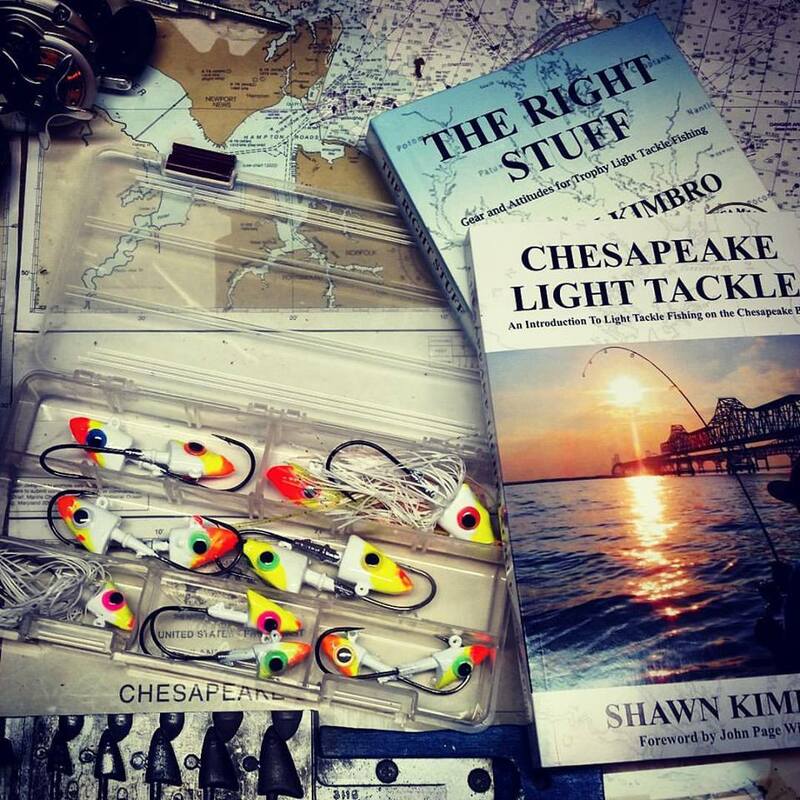 I’m relatively new to fishing light tackle in the bay and I have found your articles & posts very informative. I received your book yesterday and I can’t wait to get into it. BTW One thing that has really helped me with casting and especaily jigging is using color coded line that change color every 25′ and have black marks every 5′. I think mine is PowerPro . I really think it allows me to put the baits right in front of the fish I mark on the finder. I had an incredible day last Wed. jigging, I had charter boats all around me trolling and I was out fishing them not only in numbers but size of the fish caught. It was a blast! Over the last 5 years I have trolled and LLined mostly but I think I’ll be be hanging that equipment up permanently. Thanks again for sharing your knowledge with all of us out on the bay. That was a very enjoyable video. Thanks for sharing some close ups of your lures. Do you guys consistently jig with that kind of “bowed then snap” technique? I will have to try that. 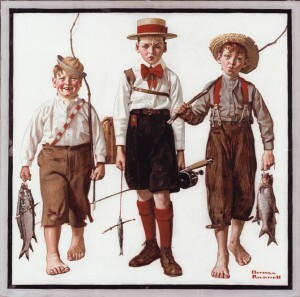 Heading up to Cape Cod for a few days, and looking forward to a summer of fishing in the Bay.